Susan Rice's Housekeeper Found Dead After FBI Interview-Fiction! - Truth or Fiction? Susan Rice’s Housekeeper Found Dead After FBI Interview-Fiction! Former National Security Advisor Susan Rice’s housekeeper was found dead in September 2017 after the FBI interviewed her about overheard conversations between Rice and Hillary Clinton and other members of the Obama administration. 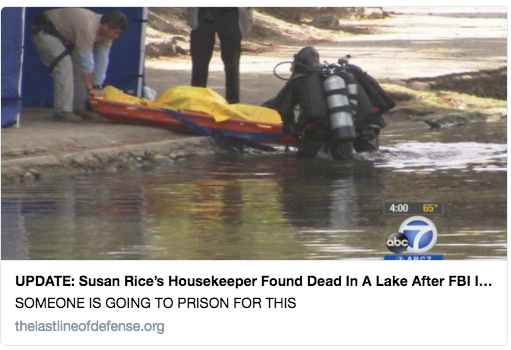 A self-described fake news website is behind false reports that Susan Rice’s housekeeper was found dead in a lake after being interviewed by the FBI in September 2017. FBI agents were seen approaching the home of Maria de la Juerta Gomez on Monday, where they stayed for a good two or more hours. According to Attorney General Jeff Sessions, Gomez was able to provide “plenty of information” to aid in the investigation into Rice’s abuse of her power in the Obama administration to “unmask” of people associated with Donald Trump in an effort to swing the election in favor of a certain “crooked” opponent of his. On Tuesday evening, Gomez’s lifeless body was found floating in Lake Hope, just outside of her hometown of Ithica, Connecticut. Police officers took some time to identify the body because her finger tips had been severed and no family was immediately able to identify her, but her identity was determined via dental records from Dr. Michael Armstrong, DDS. A well-known fake news website is behind false reports that Susan Rice’s housekeeper was found dead after an FBI interview. The Last Line of Defense story used the actual breaking news about Susan Rice’s testimony to advance the fake story that the FBI had interviewed Rice’s housekeeper regarding the matter, and that the housekeeper was later found dead. The website is known for publishing false death reports about political figures, and this is just the latest one. Save the Endangered Pacific Northwest Tree Octopus From Extinction-Fiction! NFL Fines Pittsburgh Steers $1 Million Each for Mission National Anthem-Fiction!